I find it somewhat weird and suspicious that they don't take plastic - are they laundering money or something?? I had a taste of one of their dishes at Taste of Dub and it was by far the best one I had all day. Looking forward to a meal there. @elly - this was exactly my thinking, especially given that they dont even take laser. Even more strange is that you dont even get a printed receipt, just a handwritten one from one of those receipt books you can get anywhere. I know Mr. Gallagher has been in allegedly involved in trouble before so maybe this is their way of staying in the good books? Seems like a strange thing to do though! @robert - yes you do! I really enjoyed it and have spent far more on dinners in much worse places! Then again we did go for the cheapest option and were careful by only having one glass of wine each. The reviews I had read were all by people who could afford the priciest option so was nice to be able to report good things about the cheapest one! Thanks a million for this wonderful review Deirdre - I'd love to go, but hubbie doesn't eat meat, and I can't imagine Mr Gallagher making an all fish meal for him!!! Thank you, I looked again as was sure I had seen a fish only menu but was wrong and come to think of it they didnt ask us was there anything either of us didnt eat when ordering. Looking again at the menu though I did see at the very bottom that there is a vegetarian tasting menu available - might be worth enquiring, although saying that if you go I would definitely recommend the beef for you and I dont know if you could have a table with one veggie and one meat/fish menu! I'm amased at the positive comments above. We went on Friday night and felt that this was the a total rip off. If you are going to do the minimal amounts of food then you should be providing excellent taste to compensate for the lack of amount and premium being charged. We found the food average and not worth the money. There was also little to no atmosphere in the place. I'm surprised its lasted this long. I have to say I found that everything tasted excellent when I was there and have heard the same from many other people who have eaten there. I do agree with you on the atmosphere or lack thereof. Had menu 4 this evening. Five of us really enjoyed it. Excellent food. 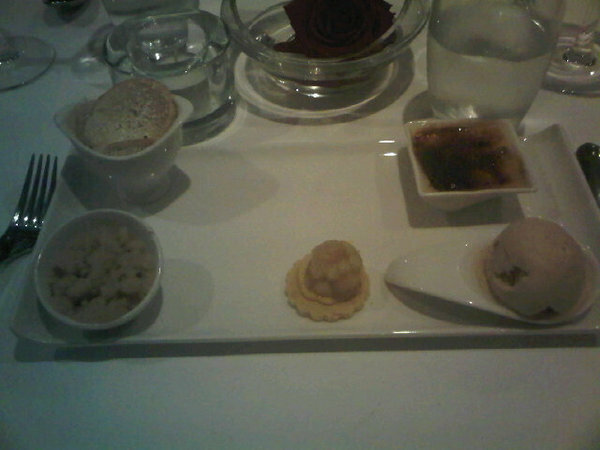 Desert was by far the weak link I think. Too many deserts on the plate & not greatly executed. Space far too tight. Plus we were 5 seated at a table for 4. Far too tight. Bathrooms tiny & not the best either. Food though was very good. Menu 4 I would highly recommend. I had the €56 tasting menu about one month ago and was very impressed. My wife does not eat meat - the waiter happily confirmed that the kitchen could swap her meat dishes for fish ones (crab; monkfish), which set the right tone. Our waiter was a familiar face, who I last saw working in Christophe's at Duck Lane, near the Jameson Distillery/Four Courts & service was professional and very good. The food was inventive and went down well. Re the credit card situation - They don't take cards to avoid the Revenue Commissioners (or some other old creditor) swooping in to garnishee the proceeds of the bank account. (I think.) They weren't terribly busy on the Thursday night I was there, but hopefully the restaurant will last the distance - I'll return. Ice cold foie gras served straight from the fridge. Very heavy handed with their seasoning. cold plates and room temp food. misinformation of dishes by staff. i wasnt happy with food and had to listen to staff discussing myself and my partner while we ate. In summary: food has excellent potential but is ruined by prices which does not match the quality of service and quality of preparation.